Each time they kissed ... there was the thrill of love ... the threat of murder! In Suspicion, wealthy, sheltered Joan Fontaine is swept off her feet by charming ne'er-do-well Cary Grant. Though warned that Grant is little more than a fortune-hunter, Fontaine marries him anyway. She remains loyal to her irresponsible husband as he plows his way from one disreputable business scheme to another. Gradually, Fontaine comes to the conclusion that Grant intends to do away with her in order to collect her inheritance ... a suspicion confirmed when Grant's likeable business partner Nigel Bruce dies under mysterious circumstances. Suspicion's stylish chills put Alfred Hitchcock on the top of the Hollywood heap...and keeps audiences on the edges of their seats to this day. So hang on for an-all suspence that's all-out Hitchcock! After back-to-back viewings of Hitchcock Signature Collection members Dial M for Murder and Foreign Correspondent, and knowing Strangers on a Train was waiting in the wings, I was starting to wonder when this little group of discs would yield the inevitable stinker. Not that I wanted to find one, mind you, but no matter how great a legend may be, even the best flop occasionally. Heck, even Mickey Mantle hit .237 one year. To avoid a clunker if possible, I decided to stick with what appeared to be a safe bet: the Cary Grant and Joan Fontaine vehicle Suspicion. Grant was fantastic in some of my favorite Hitchcock “hall of fame” movies like Notorious and North by Northwest, and Fontaine was fresh off the lead in Rebecca. So much for the safe bet, because folks, Suspicion is a stinker, especially in Hitchcock terms. The film boasts a good premise. A woman falls in love with a man whom she knows very little about, only to make some disturbing connections about him in her own mind, and start to suspect that he might be a murderer. It’s sort of Spellbound meets Shadow of Doubt. Johnny (Grant) and Lina (Fontaine) actually become acquainted when a group of single women in a rural English town introduce them on their way to church. Lina has had her eye on Johnny for a few days, as he’s always appearing in the society pages of the local paper, and they’d encountered each other a couple of days before. Johnny hijacks her on the way to church. He takes her for a walk, where after what appears to be a violent struggle, they begin a flirtation with almost as much electricity as a wet noodle. It ends with a kiss that’s supposed to be passionate, but really just isn’t. Johnny goes away for a while, leaving Lina to yearn for him and wait for his phone call. Because he’s a total player, he doesn’t ring her for three weeks. When he does call, they reunite, and Johnny demands that she marry him. Mind you, they’ve spent all of a few hours together, and this is only ten minutes into the movie. Because she’s a spinster, she agrees, and they go on a whirlwind European honeymoon. When they get back, they arrive at a palatial home, fully staffed with servants. Lina is thrilled…until a telegram arrives demanding that Johnny pay back a thousand pounds he borrowed to go on the honeymoon. Lina gets a little unsettled, and starts to ask Johnny why he married her. More specifically, she wants to know if her father’s fortune had anything to do with it. Surprisingly, the brash, arrogant Johnny tells her that yes, it had a lot to do with it. This immediately raises Lina’s suspicions, and when her father passes away, she fears for her life. Is he a pathological liar and a murderer, or is she just a paranoid bookworm who reads too many mystery novels? Sounds pretty promising, right? Perhaps that promise only contributes to how disappointed I was by the film. It’s like watching a super-talented wide receiver who take plays off in the middle of the game. It’s ugly because of the limitless potential he has. So what goes wrong in Suspicion? In Foreign Correspondent, the love angle was such a secondary story line that its hastiness was only a minor annoyance. It wasn’t the film’s raison d’etre. In Suspicion, a hasty love story is the crux of the entire story. No matter how many movies do it, I will never believe that within fifteen minutes of screen time, two people can go from complete strangers to wedded bliss. Because of that, I can’t ever really get into the Johnny/Lina relationship. Because she doesn’t know him at all, she shouldn’t be surprised at anything Johnny does. The lack of chemistry onscreen completely undermines any possibility that Johnny is in love with Lina, which wouldn’t have been such a problem if it weren’t for the ending. The original ending that Hitch wanted would have really helped this film’s shortcomings, but studios wouldn’t let it happen. Hitchcock was so convinced that he’d be able to get his way that he actually filmed much of the story without the finale completely done. He figured once he got there, the studio would say “go ahead.” Instead, he had to write an ending that just doesn’t feel like it fits a Hitchcock movie. It’s far too “happily ever after”, and it lets all the characters off the hook. To be frank, I absolutely hated it. The ending and the relationships aren’t the only problems; they’re just the most obvious ones. There’s far too much soap opera technique here, with an overloaded swelling score and a ton of accompanying earnest looks from Lina that are meant to convey pretty much any emotion. The film takes a long time to really get rolling, and when it does, it ends inside of fifteen minutes. The performances are uncharacteristically over-the-top, particularly Fontaine’s quivering Lina, which only makes it more shocking that she actually took home the Academy Award for this role. There’s little humor in the story, something decidedly unusual for this director. To me, the film’s only saving grace is the injection of life that Johnny’s old school chum Beaky (Nigel Bruce) brings to the story. The film’s most ably played character is the main vestige of comedy in the film, and Bruce plays him with a perfect combination of British charm and ill-timing. His interactions with Lina are the best scenes in the film not involving a glowing glass of milk, the only moment in the film that feels uniquely Hitchcock. Otherwise, Suspicion is a forgettable entry that is best skipped over for its many superior brethren. Suspicion appears in an aspect ratio of 1.33:1 on this double-sided, double-layered DVD; due to those dimensions, the image has not been enhanced for 16X9 televisions. I’ve seen less appealing transfers for older flicks, but I’ve seen many superior ones as well. Some of the concerns connected to sharpness. Although the movie usually demonstrated acceptable definition, the movie never came across as particularly concise. In addition, a few somewhat soft shots occurred, a factor exacerbated by some mild edge enhancement. I noticed no issues with shimmering or jagged edges, though. Source flaws were a moderate distraction. I noticed sporadic examples of specks, marks, thin lines, and blotches. Grain also was a bit heavier than expected. Blacks demonstrated pretty good depth, and contrast was fine; the film exhibited a nice silvery sheen. Shadows were acceptably defined, as the smattering of low-light shots showed decent delineation. Overall, Suspicion was consistently watchable; it just didn’t seem like anything particularly noteworthy. Similar thoughts related to the monaural soundtrack of Suspicion. A perfectly acceptable track for its era, the audio didn’t do anything particularly special. Speech sounded a little brittle and showed a smidgen of edginess, but the lines were intelligible. Effects played a small role in this talky flick. Though they lacked much life, they were clean and without any difficulties. Music was typically thin but sounded decent overall. The soundtrack worked fine for a movie from this one’s era, but it never was above average, even when I adjusted for age. In addition to the film’s trailer, the disc includes a featurette entitled Before the Fact: Suspicious Hitchcock. This 21-minute and 35-second piece provides comments from Hitchcock at Work author Bill Krohn, film historians Richard Schickel and Robert Osborne, filmmaker Peter Bogdanovich, Hitchcock’s daughter Pat, Psycho II director Richard Franklin, music historian Christopher Husted, and composer Franz Waxman’s son John. “Fact” looks at the source novel and its adaptation, cast, characters and performances, story elements and visual techniques, the film’s original ending, score, and its reception. “Fact” offers a competent overview of the production. It gets into appropriate topics in a positive – if uninspired – manner. Truthfully, the featurette feels a little “by the numbers”, as it never becomes especially insightful. Nonetheless, it gives us the basics in a pleasant and useful manner. Suspicion just isn’t very good. It’s a slow-moving film that really lacks any charisma in spite of Cary Grant, offers an annoying female lead, and suffers from an embarrassing ending. The DVD provides average picture and audio along with minor supplements. 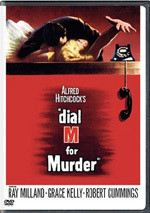 This film actually belongs in the “B” or “C” tier of Hitchcock films, so only the most avid Hitch fan would find this disc a good one to pursue. Note that this version of Suspicion comes as part of a four-movie package. Called “TCM Greatest Classic Films: Hitchcock Thrillers”, the set also includes The Wrong Man, I Confess and Strangers on a Train. “Thrillers” packs the four movies onto two DVDs; it pairs Suspicion with Train.